Ducati 1299 Panigale R Final Edition: a Whole New World! Unmistakable design and uncompromising technical choices like the Superquadro engine with a record 116 mm bore. 209 hp of pure adrenaline and 142 Nm of breathtaking torque. Cutting-edge electronics with Bosch Inertial Platform to guarantee maximum control. 1299 Panigale: the object of desire of every motorcycle enthusiast. With the 1299 Panigale R Final Edition, Ducati celebrates the twin cylinder engine that marked the history of the Superbike World Championship. From Marco Lucchinelli’s first victory with the 851 in 1988 at the first race in the history of the World Superbike Championship, to 2017 with the victories of Chaz Davies and Marco Melandri on the Panigale R, the twin cylinder from Borgo Panigale has always been a top performer of the Superbike Championship. The 1299 Panigale R Final Edition is produced in a numbered, unlimited series, and represents the perfect mix between high performance engine and racing chassis. The new livery, red rims and titanium exhaust make the 1299 Panigale R Final Edition a unique, collectible bike. The Final Edition Superquadro engine is derived from the 1299 Superleggera engine with 209 hp at 11,000 rpm and 14.5 kgm at 9,000 rpm. Thanks to the very high power and dry weight of just 168 kg, the Final Edition achieves a power to weight ratio of 1.24 hp/kg. Making the most of competition experience, a number of advanced electronic control systems have been developed that optimize engine response and chassis dynamics in every situation. The 1299 Panigale R Final Edition's monocoque chassis forms its structural backbone - compact, rigid, lightweight, and multi-functional. The 1299 Panigale R Final Edition's monocoque chassis forms its structural backbone - compact, rigid, lightweight, and multi-functional. Cast in aluminium, it attaches at its rear directly to the heads of the Superquadro engine and contains the steering head and bearings at its front. In addition to performing the function of a traditional frame, the monocoque also serves as the airbox and in this way significantly contributes to lowering the overall weight of the motorcycle. Housed inside it are the air filter, throttle bodies and fuel circuit complete with injectors, making it truly unique and a revolutionary advancement to the world of traditional motorcycle construction. True to the Panigale R's racing focus, it features competition oriented Ohlins suspension including an NIX30 fork, TTX36 shock, and steering damper, all fully manually adjustable. True to the Panigale R's racing focus, it features competition oriented Ohlins suspension including an NIX30 fork, TTX36 shock, and steering damper, all fully manually adjustable. This system provides competition-level damping and vehicle control, while being lighter than an electronic system - contributing towards the Panigale R's incredible weight advantage over the competition. The 1299 Panigale R Final Edition is equipped with the Bosch Inertial Measurement Unit (IMU), which provides information on vehicle dynamics to the cornering ABS, DWC EVO and DTC EVO for greater control and stability of the bike. 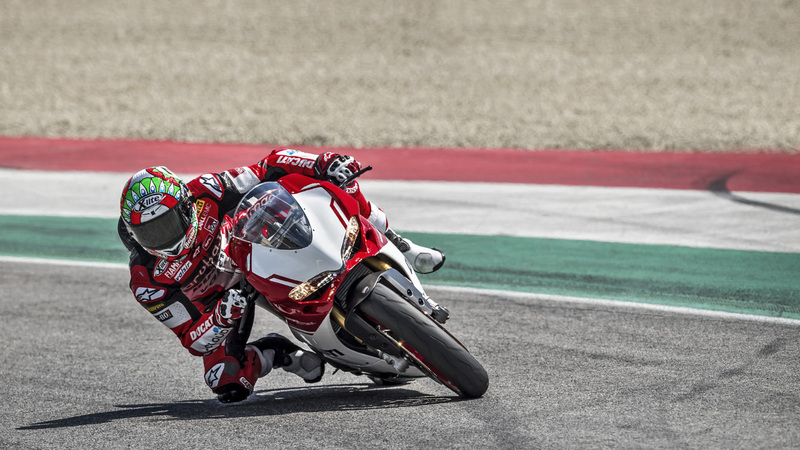 The DTC EVO on the 1299 Panigale R Final Edition is based on an algorithm that guarantees the ideal slippage of the rear tire, achieving racing performance. The 1299 Panigale R Final Edition benefits from the experience of Ducati Corse, adopting geometry which uses a 24° steering head angle along with a low swingarm pivot point. The 1299 Panigale R Final Edition benefits from the experience of Ducati Corse, adopting geometry which uses a 24° steering head angle along with a low swingarm pivot point. This enhances the bike's agility, and provides excellent rear traction in a wide variety of conditions. Titanium con-rods and valves, crankshaft with tungsten counterweights, 116 mm piston with only 2 segments, optimized intake ducts, camshafts with increased lift, throttle body with aerodynamic butterfly valves, differentiated intake trumpet height for front and rear cylinders and racing air filter, guarantee incredible peak power of 209 hp at 11,000 rpm and 14.5 kgm (104.7 lb-ft) of torque at 9,000 rpm. To control the large valves with the precise and efficient Desmodromic system, engineers chose a mixed gear and chain drive system. To control the large valves with the precise and efficient Desmodromic system, engineers chose a mixed gear and chain drive system. This chain drive accurately transmits the motion between crankshaft and camshaft, and thanks also to an automatic tensioning adjustment, offers excellent reliability with low routine maintenance costs. The 1299 Panigale R Final Edition is equipped with an Akrapovič double under-seat exhaust system that is completely made of titanium (Euro 4 approved) derived from the Panigales used by Chaz Davies and Marco Melandri in the World Superbike Championship. 3 spoke W shape forged light alloy 3.50" x 17"
Design your own leathers for an even more individual experience. Go to the Ducati SuMisura site and find out how to personalise your technical apparel to enjoy total comfort and unique style. Contact your nearest dealer and book a test ride of the 1299 Panigale R Final Edition. A track course that combines excitement, adrenaline, and enjoyment with first-rate teaching. 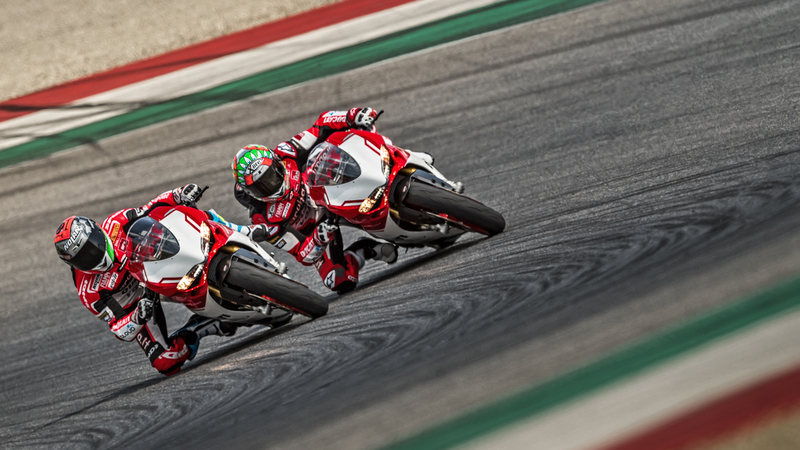 Exceptional instructors like champions Carlos Checa and Manuel Poggiali, among others. Prices listed are the Manufacturer's Suggested Retail Prices. Prices exclude dealer setup, taxes, freight, title and licensing and are subject to change. Dealer prices may vary. Pricing and specifications are subject to change. Please contact your Authorized Ducati Dealership for the most current information. Photos on this website may refer to prototypes that could undergo modifications during the development phase or European specification models; they are provided purely for informative and reference purpose and are not binding for Ducati North America, Inc., Ducati Motor Holding S.p.A, Single Shareholder Company – Audi Group Company (“Ducati”). Not all colors and/or models are available in all countries. Ducati reserves the right to make changes and improvements to any product without any obligation to give prior notice or to carry such changes to products already sold.